Every summer, the media reports on someone who died after being infected with a brain-eating amoeba. These cases usually occur after a person has visited a pool, waterpark, or a tepid lake. These horrifying infections are exceedingly rare, but they can still occur after a person comes into contact with the amoeba at home. Most recently, a woman died after inhaling a brain-eating amoeba from tap water she used in a Neti pot to irrigate her sinuses. 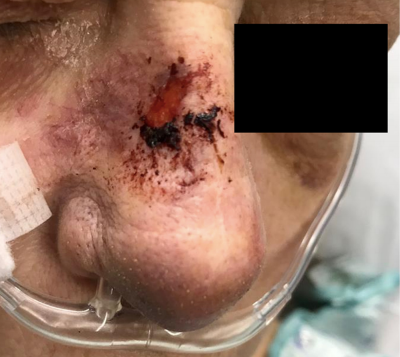 The nasal sore, initially believed to be rosacea, which preceded the patient’s brain lesion and never resolved. About 200 cases of Balamuthia have been reported globally, with at least 70 of them reported in the U.S.
Only distilled, sterile, or cooled boiled water should be used for sinus irrigation, according to the U.S. Centers for Disease Control and Prevention (CDC). However, the Seattle woman’s doctors weren’t able to definitively link the Balamuthia infection to her Neti pot, as the water in her home wasn’t tested for the amoeba. So, be cautious, but don’t freak out. You’re more likely to drown than inhale an amoeba. When your sinuses clog, your body does it for a reason. Let your body do what it needs to do. Trust a doctor? That was her first mistake.